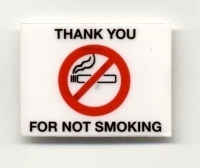 Use these decals to remind customers in all vehicles you want to keep smoke free. Decals cling firmly to smooth surfaces, yet come off without a trace. Dimensions: 1 1/2" x 2". Clear with black and red logo.